Environmental stewardship is designated as a major focus area of the United States Department of Transportation (DOT) strategic plan. According to the Environmental Protection Agency (EPA), environmental stewardship is the responsibility for environmental quality shared by all those whose actions affect the environment. The Federal Highway Administration (FHWA) supports and promotes the use of recycled highway materials in pavement construction in an effort to preserve the natural environment, reduce waste, and provide a cost effective material for constructing highways. In fact, the primary objective is to encourage the use of recycled materials in the construction of highways to the maximum economical and practical extent possible with equal or improved performance. 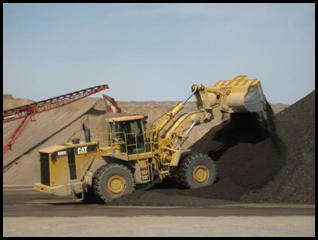 As part of the FHWA recycled materials policy, the FHWA actively promotes asphalt pavement recycling and technology. Promote the use of Reclaimed Asphalt Pavement (RAP) because the utilization of RAP can have the greatest economical, environmental, and engineering impact in pavement recycling. Specific goals include increasing the amount of highway construction and rehabilitation projects that use RAP and to increase the amount of RAP used in specific projects. This webpage provides information on the use of RAP in flexible pavements. 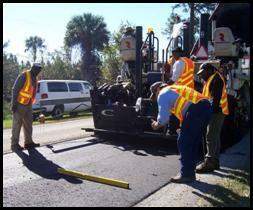 For more information on pavement recycling, please see the FHWA pavements recycling website. Readers wishing to learn more about in-place recycling techniques are referred to FHWA's guidance documents: Cold In-Place Asphalt Recycling Application Checklist (.pdf, 1 mb), Hot In-Place Asphalt Recycling Application Checklist (.pdf, 1 mb), and Cold In-Place Recycling State of Practice Review. Additional information may also be found in the Asphalt Recycling and Reclaiming Association (ARRA) publications: Basic Asphalt Recycling Manual, Full Depth Reclamation Manual, and Cold Recycling Manual. 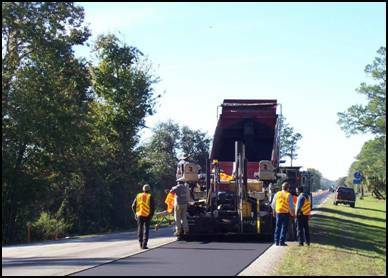 In 2007, the FHWA Office of Pavement Technology initiated an Expert Task Group (ETG) on the use of RAP in the construction and rehabilitation of flexible pavements for highways and roads. The ETG is comprised of experts on the use of RAP in asphalt paving mixtures from State DOTs, FHWA, the American Association of State Highway and Transportation Officials (AASHTO), National Asphalt Pavement Association (NAPA), and National Center for Asphalt Technology (NCAT). The purpose of the ETG is to advance the use of RAP in asphalt paving applications by providing highway agencies with critical information regarding the use of RAP, technical guidance on high-RAP projects, and direction on research activities. For more information on the RAP ETG, please see: http://www.ncat.us/RAP/. 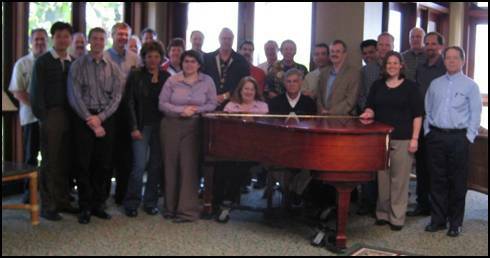 Members and Friends of the Reclaimed Asphalt Pavements (RAP) Expert Task Group (ETG) are pictured at the March 2008 meeting held in San Diego, CA. One goal of the RAP ETG is to initiate several field projects throughout the US using high percentages of RAP (25% or more) in order to increase awareness of the benefits of RAP in HMA production and develop best practices for designing, processing, and handling RAP in HMA. FHWA, NCAT, and ETG members are working with State DOTs on field projects to showcase the performance of high RAP mixtures and document their design, construction, and performance. The objectives of the field projects are documentation of the mixture design process, production, construction, performance testing, and best practices learned for future mixture design and quality control procedures. The FHWA Mobile Asphalt Material Testing Laboratory provides support in the form of mixture design replication and performance testing for the high RAP field projects. Table 1. High RAP Field Projects - This table provides a list of the locations of high RAP field projects, the percent RAP used in each project, and the dates of construction. Above, the RAP bin of a mobile HMA plant in Oakley, KS is shown. To the right, is the screen used to prevent large RAP particles from entering the mixture. The objectives of National Cooperative Highway Research Program (NCHRP) Project 9-46 are to (1) develop a mix design and analysis procedure for HMA containing high-RAP contents that provide satisfactory long-term performance and (2) propose changes to existing specifications to account for HMA containing high-RAP contents. High-RAP content is defined as greater than 25% and may exceed 50%. 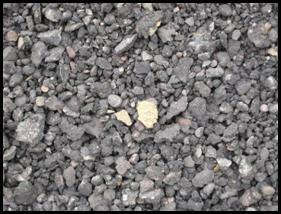 The mix design procedure is expected to be an adaptation of AASHTO R 35, Superpave Volumetric Design for Hot-Mix Asphalt. 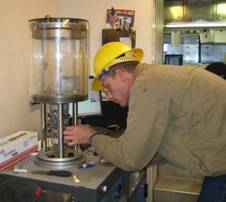 The mix analysis procedure is expected to (1) include performance-related tests and key criteria to address permanent deformation, fatigue cracking, low-temperature cracking, and moisture susceptibility and (2) identify any promising method or procedure developed to assess the durability of HMA. A mix design and analysis procedure will then be prepared in the form of an AASHTO Standard Practice for use by practicing engineers and technicians. The specification will be an adaptation of AASHTO M 323, Superpave Volumetric Mix Design. Practical guidelines for proper material management and processing of RAP (such as contained in NAPA Quality Information Series 124, Designing HMA Mixtures with High RAP Content: A Practical Guide) will also be developed. For more information on the specific tasks, please see: http://www.trb.org/TRBNet/ProjectDisplay.asp?ProjectID=1624. The mission of the Asphalt Research Consortium (ARC) is to, over the next five years, build upon prior asphalt and modified asphalt research as well as prior asphalt pavement research in order to substantially improve the understanding of the mechanisms of asphalt pavement failure modes; and employ this improved understanding of pavement failure modes to devise user-friendly, validated test methods applicable to all materials (including engineered materials) and construction methods to predict pavement performance. In particular, by using fundamental engineering principles in design of mixtures, superior performance and reduced impact on the natural environment can be optimized using a high concentration of recycled asphalt mixtures. A goal of the ARC is to develop guidelines for high level use of recycled pavement mixtures and validate these guidelines using laboratory damage resistance testing and field full scale trials. For more information, please see: http://www.arc.unr.edu/. The FHWA in conjunction with the North Central Superpave Center (NCSC) and Heritage Research Group (HRG) jointly are investigating and evaluating plant-produced HMA mixtures containing varying percentages of RAP to investigate low-temperature performance of the mixes. So far, results appear to confirm the current suggested guideline for the use of RAP in the amount of 15% or less that states that "no change is required in the binder PG or in the mixture design". However, in the case when higher amounts of RAP (i.e. greater than 25%) are used, the stiffness properties of the mixture increase (significantly in some cases) and it may be necessary to lower the PG of the binder or use blending charts to (i) determine the amount of RAP to use based on the virgin binder grade or (ii) determine the virgin binder grade and amount based on the desired amount of RAP. The results highlight some challenges in using high amounts of RAP. A primary concern is the performance of high RAP mixtures in cold climates. The addition of high amounts of RAP to an HMA mixture usually increases the mixtures stiffness. In cold climates, this may contribute to the occurrence of low-temperature cracking. Another concern is due to the uncertainty of what occurs between the virgin and the RAP binder during mixing in a HMA plant. Current activities include expanding this project to include materials from multiple HMA suppliers in order to gain valuable insight on producing HMA mixtures with RAP and to substantiate the results of the original project now referred to as Phase I. The Minnesota Department of Transportation specifies the maximum amount of RAP allowed in a mixture based on the pavement layer and traffic level. In addition, binder grade affects the maximum amount of RAP allowed. MnROAD plans to conduct a 5-year project to study the performance of RAP and determine if the present specified limits on RAP are justified. Several asphalt concrete test sections will be built and contain 30 percent RAP but vary in binder grade and fractionated RAP content. It is anticipated that the results of this research will lead to the modification of current specifications to include fractionation of RAP aggregate and/or new percentage requirements for high-RAP asphalt. The result of NCHRP Project 9-12, Incorporation of Reclaimed Asphalt Pavement in the Superpave System, this summary and technician's manual for use of RAP in Superpave®-designed HMA will be of particular interest to materials engineers in state highway agencies and to contractor personnel responsible for designing HMA according to the current Superpave® method. 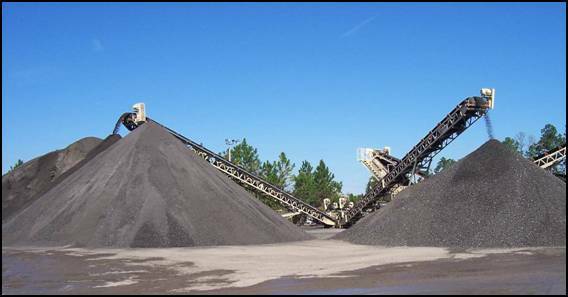 Special Report 187 Recycling Practices for HMA This report provides an overview of recycling in the asphalt industry, including both RAP and the use of materials from other industries. Topics such as comparisons between virgin and recycled asphalt are discussed including using RAP in Superpave mixtures and the use of recycling foundry sand, crumb rubber, and roofing shingles in HMA. Information Series 123 Recycling Hot Mix Asphalt Pavements NAPA's guide to processing RAP at the hot-mix asphalt plant has been updated, enhanced, and significantly expanded in 2007 and this revised publication explains how to reclaim, size, store, and determine the value of using RAP. Quality Improvement Series 124 Designing HMA Mixtures with High RAP Content: A Practical Guide This guide is a joint publication of NAPA, AASHTO, and FHWA and provides practical guidelines for HMA mixtures with at least 25 percent RAP, including materials evaluation, mix design, plant verification, and quality control necessary to produce a quality pavement. Infobrief: High Reclaimed Asphalt Pavement Use With changes in construction materials economics, stricter environmental regulations, and an emphasis on â€œgreenâ€� technologies (e.g., warm mix asphalt) and sustainable pavements, the highway community is reassessing the economic and environmental benefits of allowing higher percentages of reclaimed asphalt pavement (RAP) in premium pavements and asphalt surfaces while maintaining high-quality pavement infrastructure. 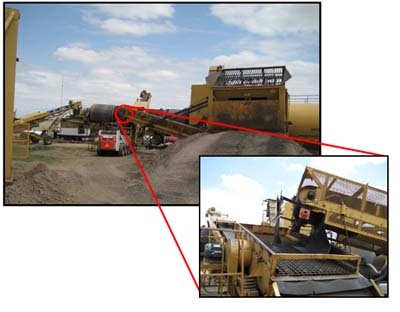 Pavement Recycling Executive Summary and Report This report documents a study conducted between 1992 and 1996 to assess the state-of- the-practice of recycled Hot Mix Asphalt (HMA) construction. Pavement Recycling Guidelines for State and Local Governments Participant's Reference Book Published in 1997, this participant's reference book was developed to support a two day workshop on pavement recycling guidelines for state and local governments and provides the following information on recycling of asphalt pavements: performance data, legislation and specification limits, selection of pavement for recycling and recycling strategies, economics of recycling, and structural design of recycled pavements. Specifically, materials and mix design, construction methods and equipment, case histories and quality control/quality assurance are discussed for HMA recycling (batch and drum plants) and asphalt surface recycling. User Guidelines for Waste and Byproduct Materials in Pavement Construction This user guideline manual presents the results of research conducted for FHWA on the use of waste and byproduct materials in pavement construction. In particular, a section on RAP is included that provides a material description, information on asphalt concrete hot recycling, and using RAP as granular base and embankment or fill material. Guidelines are provided for the use of RAP in asphalt concrete pavements construction applications and general information on evaluating the suitability of a waste or byproduct material for use in pavement construction, including engineering evaluation, environmental, and cost issues, is provided. Reclaimed Asphalt Pavement in Asphalt Mixtures: State of The Practice This report informs practitioners about the state of the practice for RAP use in the United States as well as best practices for increasing the use of RAP in asphalt pavement mixtures while maintaining high-quality pavement infrastructures. To find information on a highway agency's specifications regarding RAP, it is suggested to search the National Highway Specifications Library found here: http://specs.fhwa.dot.gov/nhswp/searchSpecifications.jsp. Asphalt Pavement Recycling Technologies A joint effort between the FHWA Recycling Team, Asphalt Recycling and Reclamation Association (ARRA), and the National Center for Asphalt Technology (NCAT) has produced a noteworthy National Highway Institute course, "Asphalt Pavement Recycling Technologies", that provides in-depth technical knowledge of several asphalt recycling technologies (in-place and plant).